Create a cosy space that's all set for your new arrival. The convertible cot/toddler bed, dresser/changer and wardrobe are available in nimbus white for a minimalist look. The Atlas 3 piece nursery set is crafted from sturdy engineered board to see your little one through their early years. The Aspen range features a high gloss, shiny and smooth finish, giving it a sleek and modern look. The dresser features three large drawers two of which can be divided into smaller compartments. The double wardrobe has hanging rails and adjustable shelving, along with baseline drawer units and the stylish cot-bed boasts teething rails. 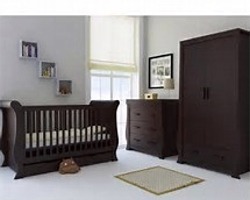 • Four piece set comprises: Wardrobe, dresser, cot-bed and shelf. • The wardrobe features soft-close doors and integral drawer unit and the robust cot-bed features a 3-position base and teething rails. The dresser can be used as a changer with addition of the detachable changer lid top, with hidden fixings leaving no marks on the top when removed. 3 good sized drawers on smooth sliding rails provide ample storage space. The bookcase style shelf has good storage space for all your essentials. 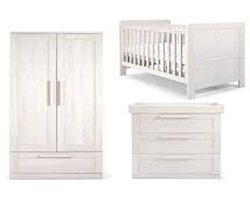 • Four piece set comprises: Wardrobe, dresser, cot-bed and shelf. A toy box can also be purchased. This set is available in a Soft Wood or Ash Grey. Babystyle Hollie Range - The Hollie furniture set brings together a timeless and stylish look with sweeping lines complimenting any nursery setting. The 4 drawer dresser offers ample storage and incorporates a detachable changer top with hidden fixings, leaving no marks once removed. The changer top when no longer required for use is designed to fit securely on the top of the Hollie wardrobe providing additional storage. The Hollie Sleigh-Bed has an under bed drawer, and the wardrobe offers versatile storage and a multi positional shelf with attached hanging rail. This set is available in Rich Walnut or Fresh White. SILVER CROSS NOTTING HILL - A simple yet statement full size cot with chunky detailing. Transforms into a toddler bed and has 3 cot base positions.